If you suffer from dry, sensitive skin, it’s time to take a closer look at your bathing habits. How often you bathe, the temperature you choose, and even how you dry off can effect the overall health and comfort of your skin. Does it sound like overkill to bathe more carefully? Let us change your mind! Here’s a look at the most common bathing bad habits for dry skin and how you can change them for the betterment of your skin. Hot water strips the skin of its natural oils, leading to drier skin after you bathe. Choose a more tepid temperature for bathing, and be sure to bathe as quickly as possible. The shorter your shower, the better for your skin. For maximum bathing benefits, and add a burst of cold water at the end of your shower! 30 seconds of cold (and we mean cold) water will help your hair become smoother and shinier, boost your immune system, wake you up, and tone your skin. It is one of the best ways to maximize your beauty routine! Vigorously rubbing the skin with your towel is the equivalent of taking a sander to your body. It is much too rough for any skin type, but for dry and sensitive skin types it can worsen skin conditions like eczema and lead to discomfort. As soon as you’re done patting dry, apply your ATOPALM Body Bundle products to damp skin. Your moisturizer will infuse the skin with MLE and hydration and then lock it in, making sure your skin retains the benefits of the dampness you otherwise would’ve dried away. 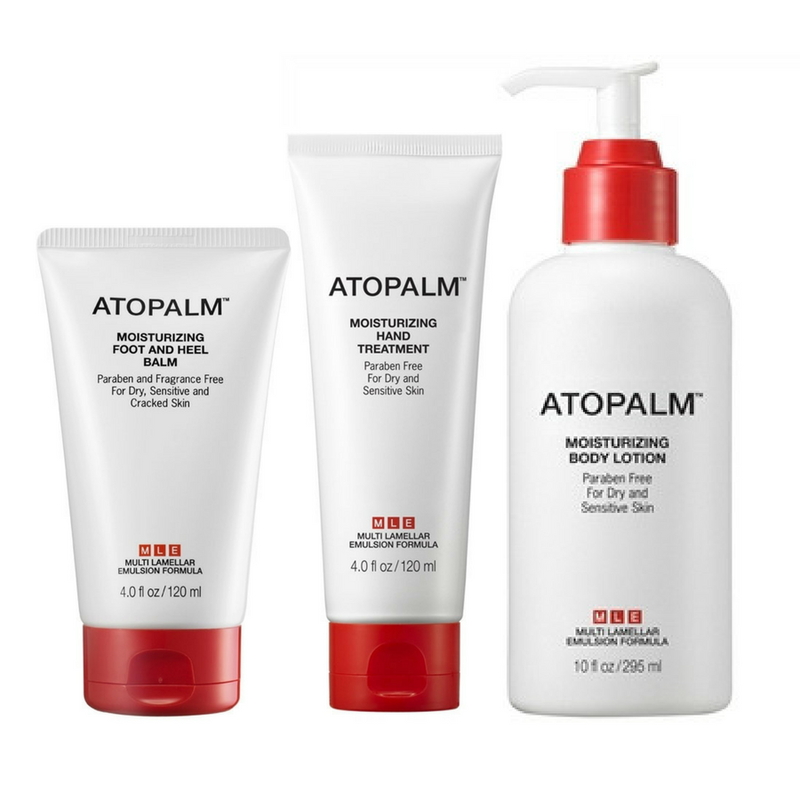 ATOPALM Body Bundle contains everything you need to moisturize from the shoulders down. Our Vogue-featured hand treatment helps keep hands comfortable and beautiful while our foot cream works on cracked heels and dry cuticles. Body lotion takes care of everything in between, leaving your entire form feeling (and looking) better than ever.